NBC reports on the eviction of the Napa Valley Model Railroad Historical Society. NBC Bay Area broadcast a report on the Napa Valley Expo Board decision to evict the Napa Valley Model Railroad Historical Society from its decades-long tenancy as part of their sweeping plan to.. The Fair Board’s decision to end the Napa Valley Model Railroad Historical Society’s lease will be a detriment to our community! Every Friday night for the past 47 years residents from our community and neighboring communities have gathered for a friendly meal and then headed over to the Fairgrounds to a relaxed workshop environment. What brings us together is the model railroading hobby, but the magic sauce is the diversity of people and the joy they find in simply gathering socially. The model train layout creates a place where neighbors can talk and mingle with some of the smartest people in our community. The society is a repository of Napa talent in electrical engineering, computer sciences, art, photography, topographical mapping and multiple disciplines including historical research and curatorship of historical information. Kids receive mentoring in positive social behavior, productive conflict resolution, cooperative group dynamics, protocol and design discussions. When people gather over a mutual interest like railroads or any hobby, strong friendships develop and the society becomes an incubator for a sense of self-worth and a belonging to the Napa community. The railroad museum is much more than a bunch of old guys playing with trains. If you want to know about anything, ask a member of this 501(c)(3) organization and there will be someone who will take the time to get you an answer. We provide a structured social environment where kids can come and participate in negotiating, exploring group dynamics, understanding the democratic process and the chain of command native to any well-run institution across a multitude of generations. We are a healthy place where kids can grow up. I recently asked why the Fair Board was going to terminate the railroad historical society’s lease when it is such a healthy, accessible and beneficial asset to our community. I found out that they had decided to replace what took 47 years to create with a parking lot. Folks…for several years the Fair Board has had a piece of paper called a Master Plan but they do not have the money to build the pretty pictures they see on this grand vision of a Master Plan. In the desire to create a pop culture venue and event center, part of the Fair Board wants to eliminate the model railroad with the hopes of someday actuating this new master plan which competes with private enterprise venues. Locals who have recently attended the summer fairs have noticed the changes. Do you remember the Sons of Italy’s spaghetti and handmade meat balls at the summer fair? Gone! Do you remember the fireman’s corn? Gone! PTA Hamburgers? Gone! Rodeo? Gone! Destruction derby? Gone! The Napa Valley Exposition is a vital part of the diverse Napa Valley community and showcases our agricultural heritage, provides a high quality entertainment venue and cultivates recreational and educational opportunities for residents and visitors of all ages. The railroad layout is a one of a kind hand built art installation and is a functioning model. It is literally a part of the building in which it resides. It is too complex of a set-up and would be impractical to relocate to another location, even if another 3200 square foot space could be secured. The Napa Valley Model Railroad Historical Society’s lease terminates on December 31, 2017, unless the Fair Board decides to sincerely allow time for legitimate opportunity of public comment or includes the railroad museum in the newest Master Plan. The Fair Board’s rushed vote has the appearance of a political maneuver without proper community comment and now the community is stuck with their destructive vote. Another part of the social fabric of our fragile community will end up under the blade of a bulldozer and maybe someday you will end up with a VIP parking lot for a few more cars. The community can help the Fair Board become unstuck by asking the Fair Board to have a proper public comment period where the Board can receive comment from all interested parties. Perhaps the Fair Board doesn’t consider public comment because it lacks a constituency. Nevertheless, it has a duty to the public and to its mission statement. The issue should be voted on with all stakeholders’ opinions out in the open and every Fair Board member allowed an informed opportunity to vote. The purpose of public comment is to allow the public to participate in the development and changes done by agencies to their community. We remember the past redevelopments that have sacrificed our uniqueness and beauty only provided by unreplaceable historic buildings and byways. Rather than restore and preserve, agencies have ordered their destruction, stripping Napa Valley of its character. Do we really want to become another big box community indistinguishable from every other one? Or do we protect our heritage, history and beloved institutions and accommodate the new opportunities around them? We’ve seen other master plans without money come and go. This one is not different. It is, as of today, still unfunded. Yet, without promise, should we the citizens of Napa allow what we’ve already built, love and treasure to be destroyed? 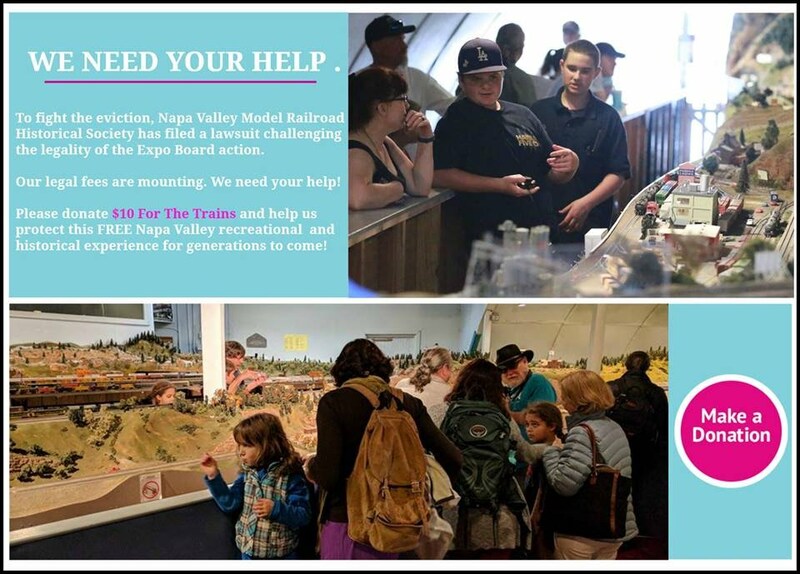 Save the Napa Valley Model Railroad Historical Society! Put up a fight Napa!